Prepare for a bad joke to start this post, because I am serious thinking perhaps Arizona should consider renaming itself to Ari-snow-na. (Rim shot. I’ll be here all week (/year). Remember to tip your waitresses). Seriously, I saw more snow in Arizona over the last three days than I had seen all year back home in Terre Haute (though the caveat there is that I have not actually spent more than a few days in Terre Haute since the bad weather season began, thanks to Christmas in Wisconsin, New Year in Florida and the beginning of traveling with Choppy shortly thereafter). After leaving snowy Tucson behind, I headed up to the Grand Canyon. As a road-tripping family (as well as a family who spent a lot of time in Arizona during the winter, thanks to family and friends living there), this was definitely not my first trip to the Grand Canyon. However, when I got there, it was very snowy and cold, unlike any previous visit I had made to the Canyon. And here is where I make a confession: as a kid, I didn’t think that the Grand Canyon – at least from the Rim – was that big of a deal. Now, to flesh that out, you need to know a couple things. First, I only remember visiting the Grand Canyon during the summer, when I recall it was very busy (though not the busiest National Park, a dubious honor that goes to Yosemite (which also gets the dubious honor of being the coldest place I have ever camped – in related news, guess where I am not planning on visiting this year with Choppy?)). 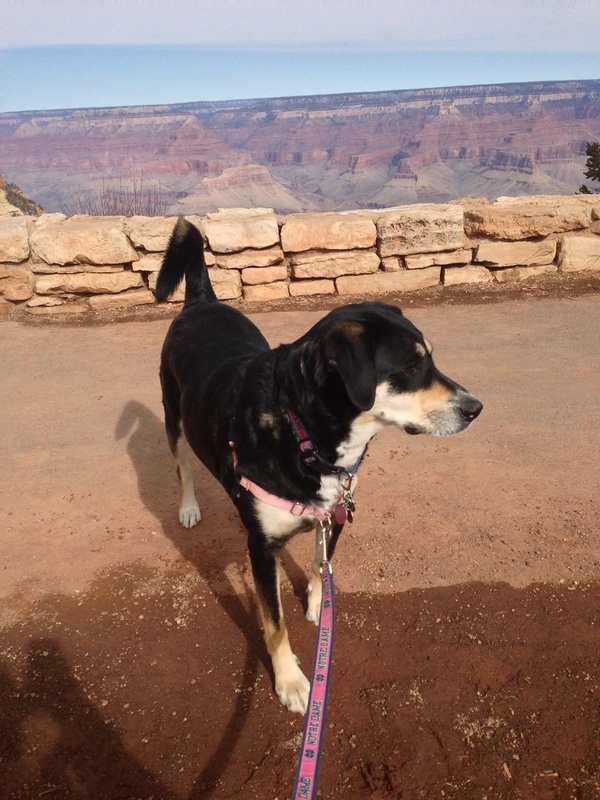 Second, I was spoiled about the Grand Canyon. We did a family overnight rafting trip through the Grand Canyon when I was in high school, which involved one of the coolest things I have ever done (if not the coolest): we took a helicopter over the edge of the Grand Canyon, landing at the bottom of the Canyon and picking up the raft that we would then take the rest of the way. In case you are wondering, it felt exactly like being in a movie. An awesome movie. Today? Despite the cold and snow, the Grand Canyon was amazing. I have to rescind all previous comments I have made about the Grand Canyon being overrated. Because, seriously. Not overrated. At least in the winter, when you are one of only a few people at the park, even on a Saturday. Seriously, this time of year, you get to drive roads that are normally only open to shuttle buses, you get to have stunning views entirely to yourself, and even when other people show up, you all seem to be in the same sort of “I can’t believe I have all of this amazingness all to myself (and, temporarily, you, random person I will shortly press into taking a picture of me and my dog)” haze. I took a ton of pictures of the Grand Canyon itself, but really? I’m not a professional photographer, and you can look up much better photos of the stunning views online. So, here are four random pictures I did take, for your viewing pleasure. This? This is Choppy at our first stop on the Grand Canyon South Rim. As you can see, despite being in one of the most amazingly beautiful places in the world, she is entirely uninterested in viewing what is behind her, because just off-camera is a chihuahua. And, in dog world, that’s far more interesting than scenery. 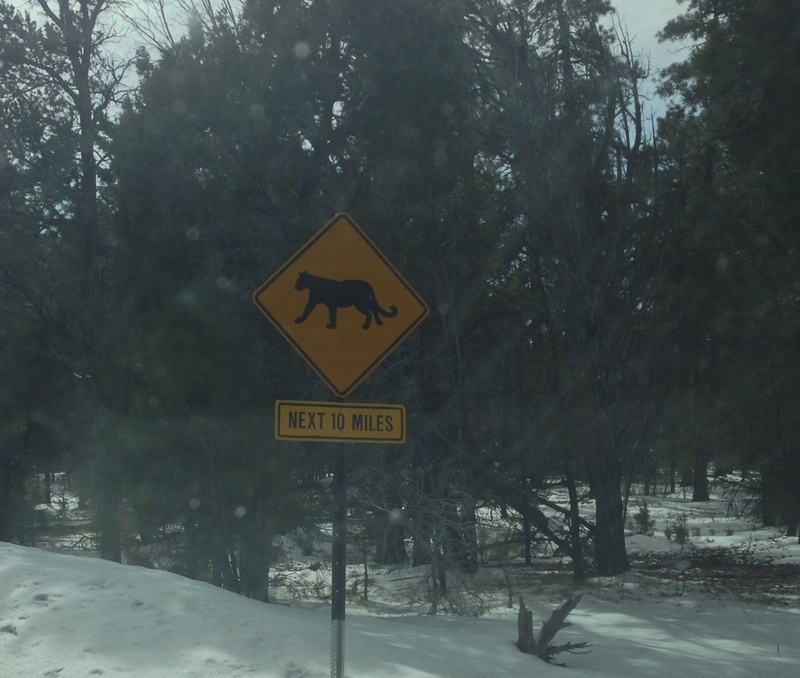 A Catamount Crossing (or Cougar Crossing, though I prefer Catamount Crossing, considering the lack of any bars featuring cosmo specials that I ran across while visiting the Grand Canyon. (Seriously, people, I can do this all night (/year))). Very happily, I did not see any mountain lions/catamounts/panthers/cougars. In related news, I should really do a post ranking “animals I am afraid will kill/eat me and/or Choppy” post at some point. Because this seems to be a common theme around here. Animal Alert! It’s an elk! Actually, it’s two elks, though I didn’t realize it until I was looking at the pictures later. Elk #2 is sort of hidden, though. Well, maybe not hidden, but definitely not so obvious as Elk #1 standing around in the pine trees. 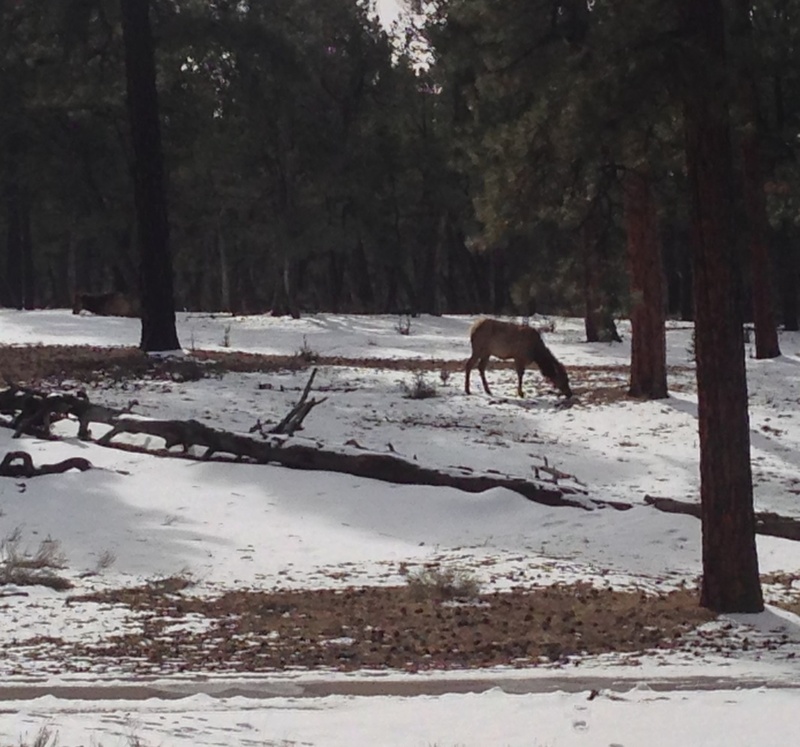 I also saw some deer as well (in a true, cars stopped along the road, nearly causing accidents, western National Park renowned animal alert), but I see deer all the time, and I didn’t bother to stop and take pictures of them. 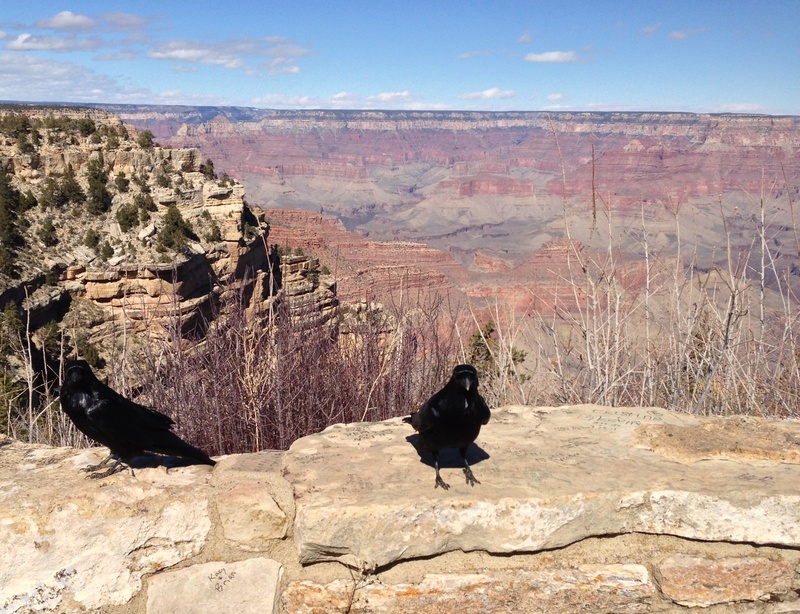 These ravens wanted something to eat. I did not feed them. Random people who stopped after me definitely did, though. The proper reaction to this is probably to view the person feeding the ravens as a rule-breaking, horrible person. Mostly, though, I was just jealous. Because I really wanted to feed them. As you can see from their close proximity, they obviously wanted me to do so as well. So, the trip to the Grand Canyon was great. And now? With my 34th birthday looming on Monday, it’s time to head somewhere for a bit of fun: Las Vegas, here we come! Previous Previous post: Sledding Weather? Next Next post: Vegas, Baby, Vegas! Well, thank God you are not dressing Choppy in native dress-lol have a great trip! Happy Birthday for the 25th Sarah ….. have a wonderful day ! Lucky lady .. spending your birthday in Las Vegas (sigh !) as i do loads of washing. Not fair, not fair at all !! Choppy have you remembered to buy a pressie for Sarah – no i will not tell her what it is. Enjoy yourselves you two delightful, ditzy ladies !!! It’s good to be a dog, at least your dog! This is true! She has a most excellent (and easy) life! Enjoyed this post. Thanks for sharing and enjoy the day. Thank you – and have a great day, too! Great post Sarah and thank you for taking us along. Its probably good you didn’t feed the wildlife. Sometimes they get real dependent on us for treats and leave a mess behind. It’s pretty bad at some parks I’ve been in – the animals are very dependent on the people. And once that happens, they often get killed on the roads or have to be taken care of, because they are likely to hurt someone. It’s sad. This is true. We have read and heard stories of many birds of prey that have been injured trying to get something.